Microsoft today added four new accessories to its lineup (a controller as well as a keyboard and two mice), all available before the holiday season this year. Gamers will be most interested in the wired Xbox One controller for Windows, slated to arrive in November 2014 for $59.95. To use this in conjunction with your PC, just plug in the cable into the controller on one end and into a free USB port on the other end. 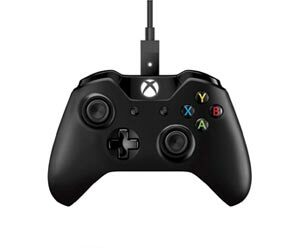 If you want to use the same controller with your Xbox One, you can do so both wirelessly or connected via the cable. This is the same Xbox One controller console gamers already know. It is compatible with Windows 7 and Windows 8, requires a Pentium 300 MHz or higher processor, 128MB of RAM, and 150MB of hard disk space. The main difference is the wired USB cable. Immersive gaming: With impulse triggers, weapons, crashes and jolts come to life. This only works in supported games, and only on the Xbox One. Precision controls: The D-pad recognizes both sweeping and directional movements, the thumbstick offers better grip and accuracy, and the triggers and bumpers have been redesigned for quick access. Better ergonomics: The Xbox One controller fits a wider range of hand sizes for a more comfortable gaming experience. Connect to your PC or Xbox: A single controller for two killer platforms. Use wired with a PC via a free USB port, or connect to your Xbox One either wired or wirelessly. More compatibility: Compatible with Kinect for Xbox One, Xbox One Play and Charge Kit, and the Xbox One Chat Headset. You’ll remember that back in June, Microsoft released 32-bit and 64-bit Windows drivers for the Xbox One controller. Today’s announcement is thus just a natural progression of its gaming accessories lineup. The next step is to enable wireless gaming with Windows PCs.